Summer has arrived in Niagara in full force even though it seems like winter just left. You will not hear me complaining about the heat, bring it on. Even though our spring has not been stellar Steve Bauer Bike Tours has been busy with many day excursions in the Niagara region. 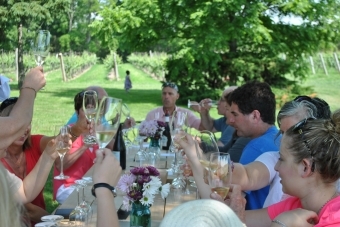 Just this past weekend we hosted a fine group of people who attended a unique SBBT Summer Solstice getaway which emphasised great biking, fine wine and dining and a really cool concert at Tawse winery. It was a full, yet amazing day. Our rolling 70 km ride through the short hills and surrounding vineyard landscapes was the first portion of our day to get in exercise. After the ride everyone cleaned up at the hotel before heading over Kew Vineyards for a delicious picnic lunch next to the vineyard prepared by the Wellington Court Café. The food was complemented with a variety of fantastic quality wines of KEW during the hosted wine tasting. Thereafter we moved on to our next stop just 10 minutes away to the unique Foreign Affair Winery where the owners have taken the lead with “appassimento" vinification wines such as the famous Amarones' produced in Italy. Guests were impressed by the full bodied yet balanced products presented at Foreign Affair. To top off this ideal Niagara getaway experience we rolled up the escarpment to the spectacular setting of Tawse Winery nestled into the bench of the Niagara escarpment with vineyard and lake views to die for. We joined into the Tawse annual Summer Solstice party featuring the great Jim Cuddy band and a couple of opening acts including Firefall. Our guests sipped on the various wines of Tawse, indulged in the diverse complementing food truck fare, and listened to the bands under perfect summer skies. What else would you want to be doing on June 28? Mark your calendar for next year! This top notch day with Steve Bauer Bike Tours should not be missed. The Tour starts this weekend and soon we will be heading to France to review final details of our Tour de France Signature Trip. It is approaching very fast and this excursion to Le Tour never disappoints. Over the years our guests have told us that “Le Tour" trip experience remains as one of their most memorable international travel highlights. This year's trip (July 21-28) which focuses on the Pyrenees, Bordeaux and Paris still has some spots available. Send us a note if you are keen to join in. First we will welcome you at the private Chateau of Saint Marthory which will be exclusive to ourselves while riding in the Pyrennees. On arrival day we will do a warm up ride, then challenge the Pyrenees climbs over the next 3 days and watch the Tour live. On transfer day to Bordeaux, we will watch the start of Stage 19 and ride part of the course. The Relais & Chateau Le St-James will be our headquarter for two nights while we do one last ride to the time-trial on Saturday before heading to Paris on Sunday and watch the grand finale.